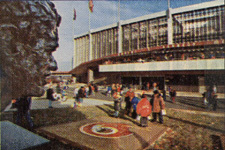 "Cramped, aging, on the verge of being replaced, Robert F. Kennedy Memorial Stadium nonetheless shakes and shimmies to the incessant frumbeat of Washington Redskins fans' cheers eight Sundays a year. Sure, the crowds have looked a little sparse recently, but don't think that means tickets have suddenly become available for Washington's other sporting passion (aside from politics and rumor-mongering). The tight squeeze at RFK stems from its cozy confines. At 56,454 seats, it is the second-smallest venue in the NFL. Part of RFK's appeal is that closed-in feeling that allows cheering to reverberate and give the Redskins a true home-field advantage. The end-zone seats are closest to the field, allowing fans to ride visiting quarterbacks when their teams must operate in the shadow of the goal posts. 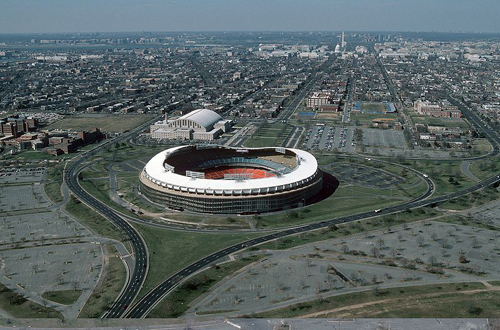 RFK Stadium lacks many of the modern conveniences. It has no luxuary boxes, no premium seating and an open press box cursed by sportswriters. Stadium employees work for the city, not the Redskins, and are known to give civil servants and uncivil reputation. The club hopes to have a new stadium, seating 78,600, open for the 1997 season. That, however, would move the Redskins from the nation's capital, their home since 1937, to surburban Landover, Maryland, just 18 miles from Baltimore." December 22, 1996 - In the final NFL game at RFK Stadium - a contest that featured backups on both teams and had no bearing on the playoffs - the Redskins took a little of the sting away from their second-half colapse by matching their biggest ever margin of victory over their fiercest rival, the Dallas Cowboys, 37-10. With the game of little consequence, the loudest ovations of the day came at halftime, when 32 present and former Redskins stars emerged from the tunnel, ran up the dugout steps and jogged onto the field one last time. The biggest cheers were for Art Monk, John Riggins, Sonny Jurgensen, Darrell Green and especially Dexter Manley, who had to get special permission from a Texas parole board to attend because of his recent cocaine conviction. After the final play at RFK Stadium - the Redskins' Ken Harvey tackled Herschel Walker near midfield at 7:01 p.m. EDT - thousands of raucous fans flooded the field. There were numerous arrests; details were not immediately available. By the time the scene was clear, the rectangular playing surface was shredded, with huge chunks missing and paper strewn everywhere. Jonah Ray and his two friends joyously ran off the field, each clutching a handful of RFK Stadium sod. "I just wanted a piece of RFK," said the 14-year old boy, showing off his prized possession. 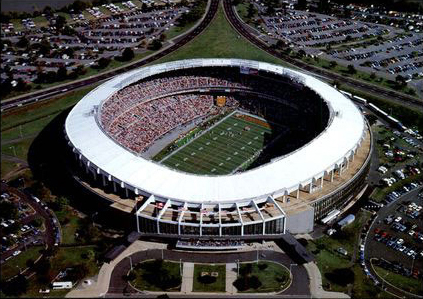 The Redskins are moving from the 53,000-seat stadium, known as D.C. Stadium when it was built in 1961 and now the smallest in the NFL, into a 78,600-seat state-of-the-art facility five miles away in Landover, Maryland. Team owner Jack Kent Cooke, who couldn't attend yesterday's game because of illness is building the stadium because he says he needs more luxuary boxes to remain financially competitive. Exit National Airport following signs for I-395 and 50 West to Washington. On George Washington Parkway take exit for I-395 North. Stay on 395 North, across the Potomac River, for approximately three miles. Once past the Maine Avenue exit, stay in the left lane of the freeway. I-395 will exit to the right to the Capitol and Senate buildings. Do not follow I-395 North; stay left for the stadium. Proceed straight ahead in the left lanes to the exit at Sixth Street Southeast and Navy Yard. At bottom of the ramp go left at traffic light onto Sixth Street. Stay on 6th Street for .05 miles to Independence Avenue. Turn Right onto Independence Ave. and stay on Independence for 1.1 miles to 19th Street. Turn Left onto 19th Street and travel one block to East Capitol Street. Turn right on East Capitol to the stadium. Follow Route 1 North to I-395 North ( to Washington). On I-395, follow directions as from National Airport. Go East from Union Station along Massachusetts Avenue. Continue past Stanton Square on Massachusetts to Lincoln Park (at 12th Street). Go around Lincoln Park to East Capitol Street and turn right onto East Capitol. Follow East Capitol to stadium. Follow Constitution East past the Capitol to Maryland Avenue. Turn left on Maryland and go two blocks to Stanton Square. At Stanton Square, turn right onto Massachusetts Avenue. On Massachusetts, follow directions as from Union Station. To make your visit to RFK easier please consider taking Metro's Blue/Orange Line to the Stadium-Armory Station. Take the Red Line toward Shady Grove. Travel three stops to Metro Center. At Metro Center switch to the Blue-Orange Line towards Addison Rd.-New Carrollton. Travel eight stops to the Stadium-Armory stop at 19th and East Capitol St. Exit the Metro and follow East Capitol St. to the stadium. From National Airport Take the Yellow Line towards Mt. Vernon Sq.-UDC. Travel four stops to L'Enfant Plaza. At L'Enfant Plaza transfer to the Blue-Orange Line towards Addison Rd.-New Carrollton. Travel five stops to the Stadium-Armory stop and exit the Metro. Follow East Capitol St. to the stadium.